Rarely does a piece of legislation come forward that calls for complete rejection. 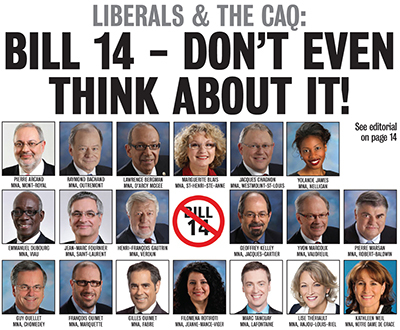 Bill 14 however is just such a piece of proposed law. No Liberal or CAQ MNA should even think of compromise or common cause with the PQ government of Pauline Marois on this regressive and retrograde proposal. Its rejection is compelled not just by the social, cultural and economic damage it will cause; not just by the civil rights - legislative and acquired - that are once again aborted ; but by the sheer transparent political opportunism and venal prejudice that gave it birth. We have had linguistic peace for the better part of ten years, save for the unnecessary and humiliating experience of Bill 104. There is no threat to French today, if there ever was. As an example, the OQLF's own figures demonstrate that 85% of businesses in downtown Montreal serve customers in French. Even on the West Island, the figure is 76%. Cultural communities, particularly the Italian and Jewish communities, are more than 80% bilingual. This legislation is meant to do nothing more than deflect attention from the humiliations already suffered by this government on the critical economic issues of the day which it has so early in its mandate proven inept and incompetent at handling. It is meant to raise once again the false sceptre of fear of the "other." The false demon of "assimilation." It is meant to propogate once again the politics of division and discord at the lowest common denominator upon which the separatists have constructed so much of their political edifice. This Bill demands that small businesses of 26-49 employees face Francization. In an already stagnant economic environment that accompanies every separatist electoral victory, this government would impose more burdens. Small business in Quebec, responsible for 80% of new job creation, now spends some 19 full working days a year dealing with government compliance issues. This Bill would raise that number. We cannot afford more destruction of productivity. We cannot afford some three weeks taken out of our economic cycle every year. And worse, Quebec cannot afford business closures due to the frustration of entrepreneurs with the suffocating statism of our bureaucrats. This Bill proposes to do away with muncipalities' bilingual status even when they have been grandfathered in. It would no longer allow for the basic right of communities to decide for themselves how their government transmits vital information to its citizens. It would replace the co-operation we now have at the muncipal level with a coercion based on a linguistic purity test of mother tongue rather than common usage and common sense. Instead of building bridges of understanding, it would construct walls of suspicion. This Bill threatens to impede the progress of young people in their education by demanding a "mastery" of French merely to obtain a high school diploma. Students already have to pass Quebec Ministerial exams in order to graduate. How much more of a burden does this government want to impose, or does it want to give bureaucrats the power of caprice to enforce subjective standards that would permanently destroy the English school system? This Bill is a hateful and vengeful proposal put forward by a government floundering in its own incompetence. No MNA of goodwill should abide by, acquiesce in or acknowledge with their vote, this infamous act. Whoever does so should know that the voters, - Francophone and Allophone and Anglophone - will not soon forget the havoc it will unleash.